Every summer I find myself loading up on all the delicious fruits and berries of the season. I often end up with way more than we could possibly eat before it goes bad. I love using them up in pies, cakes, pancakes, tarts, muffins, and quick breads, but ice cream is an easy way to use up a lot of fruit and it keeps for a while. And there are endless possibilities! Preheat the oven to 400°F. 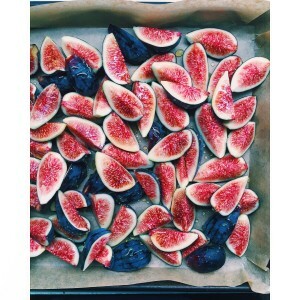 Place the figs on a parchment lined sheet pan and sprinkle the brown sugar and the honey over them. Roast for 15 minutes, remove from oven and let cool. Once cooled a bit, pour the figs and all of the juices that accumulated into a blender (I use a vitamix). 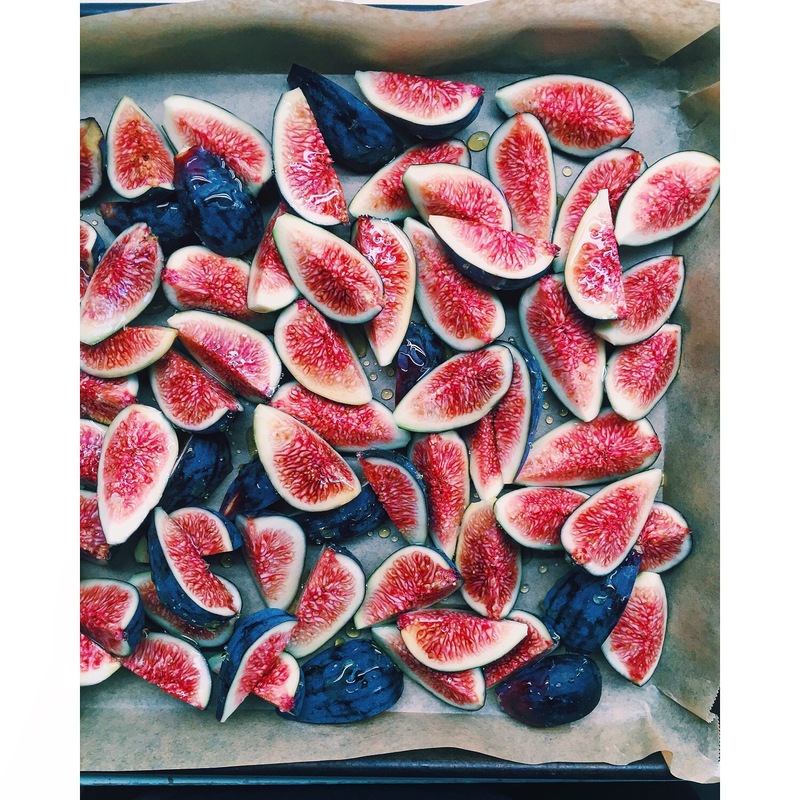 I pureed the figs, but if you prefer some chunks, blend a little less. Pour the fig mixture into a bowl and set aside. Fill a very large bowl with ice and water. Set aside. Pour the milk into a heavy saucepan. Split the vanilla bean lengthwise, open and scrape the seeds out with your knife. Put the seeds and the vanilla bean pod into the saucepan with the milk. Bring to just below a simmer over medium heat. You really just want to steam the milk, so turn off the heat just before you see bubbles forming along the edges. Meanwhile, in a heatproof bowl, whisk the egg yolks, sugar, and salt. Once the milk is steaming, drizzle in cupfuls of the hot milk into the egg yolk mixture while vigorously whisking so you don’t cook the eggs. Once most of the milk has been incorporated into the egg yolks, pour the mixture back into the saucepan. At this point, you can also discard the vanilla bean pod. Put the saucepan back over medium heat, and using a rubber spatula, stir the mixture constantly, being sure to scrape the bottom and sides of the pan. Once the mixture is thick enough that it coats the spatula (and a clean line is seen if you run your finger across the coated spatula), pour the mixture into a strainer set over a clean bowl and nestle this bowl into your large bowl of ice water. Stir the mixture occasionally until it cools down. Once cool, remove from ice water and stir in the heavy cream, followed by the pureed figs. Refrigerate this until cold (45°F). Once cold, it’s ready to go into your ice cream maker. Pack the ice cream into freezer safe containers (I often use metal loaf pans and cover with wax paper) and freeze the ice cream until firm. Preheat the oven to 325°F. Line two sheet pans with parchment paper or silpats. Place the almonds and sugar in a food processor. Pulse until the almonds are finely ground. Using a stand mixer, beat the butter with half of the almond-sugar mixture. Beat in the egg yolk and extract until well blended. Add remaining almond-sugar mixture, blending well. Whisk the dry ingredients together in a bowl. Slowly mix the dry ingredients into the wet ingredients on low speed until everything is incorporated. Scrape the dough out onto a lightly floured surface and roll to about 1/8″-1/4″ thickness. Using a 2″ cookie cutter, cut out as many cookies as you can and place them on the prepared sheet pans. Re-roll the dough scraps and cut out more cookies. Once all the cookies have been cut out, place the sheet pans in the refrigerator for 10-15 minutes. Bake the cookies for 8-10 minutes, until the outer edges feel firm, but the centers are still soft. Cool the cookies completely on the baking sheets. 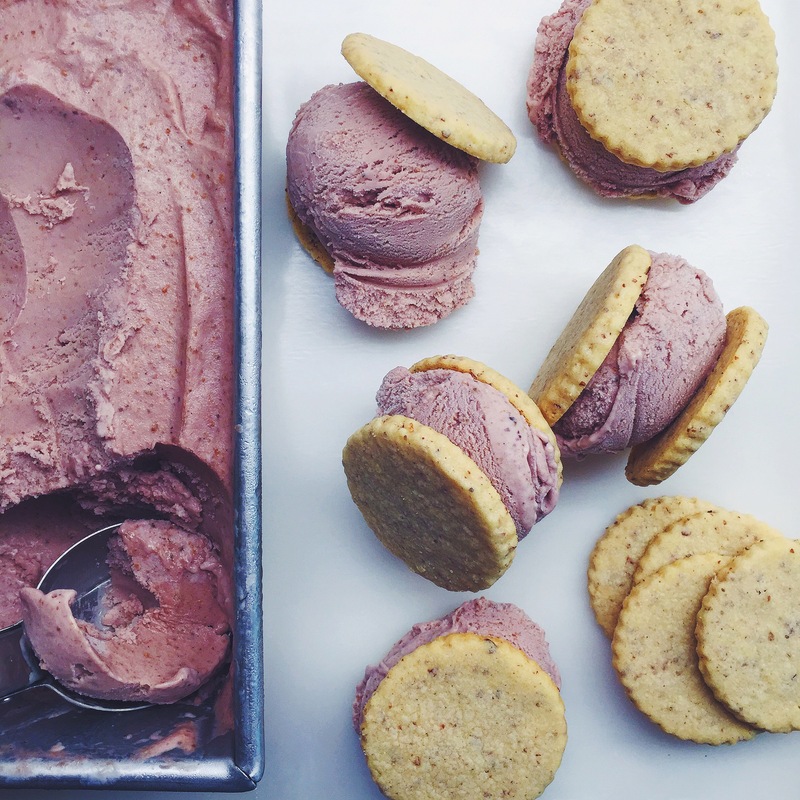 Once the cookies are cooled and your ice cream is firm, you can make ice cream sandwiches!